Since I know we're all still thinking about resolutions for the new year, here are some awesome menu planning ideas from Jennifer that will help you get organized and save money. This would work great in conjunction with our weekly dry erase menu board! Menu planning saves me money at the grocery store. I love grocery shopping. I especially love going to upscale grocery stores like Whole Foods and Central Market. My favorite aisle is the fruit and vegetable aisle, I love seeing how they are displayed. My love of grocery shopping usually overcomes my food budget and I gather everything that looks good to me into my cart. Recently my budget has been protesting about all the extras that I bring home. Sometimes I have so many fruits and vegetables that we can’t eat them all before they go bad. Something needed to change. I have tried several different meal planning methods over the years, but this time I found something that the whole family could live with. Our family usually eats at home every night, we only eat out once a month or so. Here is how I plan my menus to save time and money at the grocery store. *To have seven meals worth of dinners I discovered that I needed to cook 5 nights. The other two nights were leftover nights. *I chose themes for our meals, something broad enough that everyone in the family would like it. The themes that we are using right now are: breakfast for dinner, Mexican, Chinese/Thai, soup (winter)or salad (summer), and beef or chicken. *I organized all of our favorite dinners into one of these categories and put them all in a tabbed notebook. *When its time to go grocery shopping I look through my notebook and choose 1 meal from each category. I add what I need my shopping list and voila, I have a week's worth of menus planned and a shopping list in about 10 minutes. I used to have a night for each theme, but I discovered that I needed more flexibility. Now I just have a list of meals for the week (sometimes I do two weeks at a time) and I usually decide in the morning what we are going to have that evening. *When someone loves a recipe I write on the recipe who liked it and the day we ate it so I can make sure to have it again and put it in the notebook. This has brought several new family favorites into our dinner rotation. *I usually clean out the fridge and check the freezer and pantry just before I choose my menus. This gives me a better idea of what I already have on hand so that I don’t buy things I already have. I stock up on things that we eat all the time when they go on sale. Things like beans and pineapple tidbits. I know that they will get eaten and they taste better when they are on sale. *Leftover nights are really fun at our house, I either take all the leftovers out of the fridge and put them on the table and let everyone make up their own dinner or I tell everyone that I am too tired to cook and its “nuts and berries” night. On “nuts and berries” nights they forage in the cupboards and the fridge and come up with their own meal. We hope this system will help you reach your goals in 2011, or at least save you a little more time and money for crafting! Absolutely agree. And I have started shopping online as well, which I believe also saves me money. Although I pay a $5 delivery fee, there is no impulse buying, and if I go "over budget" I can just go through my grocery list and take out any non essentials. How funny - I've got a post coming up tomorrow about meal planning, too, but my system is simpler, mainly because there are just the two of us and hubby eats whatever I fix! Part of my system is the stocking up part - each year in Feb. or March, after we've gotten our income tax refund, I go to a local meat market and get a couple of freezer specials that keep us in good quality meats for most of the year. I also go to BJ's and stock up on enough laundry detergent, fabric softener, dish detergent (and dishwasher tabs), and non-perishables for a year (not so much paper products because I don't have the storage space). And I watch the sales and stock up on canned goods, rice, sugar, margarine, cheese, and anything that will keep up to a year either in the freezers or on the shelves in our garage. It really works for us, and makes the weekly grocery runs much less painful! My only problem with meal planning is that if I buy apples for a breakfast my kids will eat them whenever. But I meal plan like you and don't assign a meal to a day and decide that day what I will pick, and I go shopping in cubbards before I hit food store. Great system! Now that I'm an empty nester and my husband is willing to eat leftovers I make a full recipe and serve it two nights in a row. Saves me a night of cooking. Another time saver is buying a deli-roasted chicken. Our chain store has a delicious one for $4.99 every day (btw--it's not Walmart...I hate theirs, no flavor) and it's a good sized chicken too. The first night I serve it with a baked sweet potato and a green veg, like roasted broccoli or brussel sprouts since the oven is on anyway. The second night I use the remaining meat for Moroccan chicken salad in warm weather and in cold a hot casserole. We do this too! I plan meals for each day so that when I come home from work, I know exactly what I'm cooking. This takes out the "Ugggg. I totally do not feel like being creative or making a decision right now!" excuse to just go out and eat. We also stockpile in our freezer when meat is on sale. So there have been "clean out the freezer" campaigns where our grocery bill for the week literally only cost around $30 for a family of four because we used what we had on hand to create our menus. We use all leftovers for the grownups to take sack lunches to work. It truly works VERY well and involves a minimal amount of planning and ONE trip to the grocery store. I love it! Thanks so much for sharing this great idea! Where did you get the cute and handy menu/shopping list in the picture? I would love to have some of those to use while shopping. Thanks for sharing! I have been thinking about doing planned out menus for my family as a way to save on grocery. I think I may use your method! Thanks again! Your tips are helpful! Thanks for sharing! Love that idea! Thanks so much for sharing. I recently started a dinner swap with a friend. I cook for her family (and mine) one night a week, and she cooks for mine one night. Cooking twice a usal recipe is not hard at all (how many times have you thrown away half a pot of chili that no one would eat?). It makes menu planning just a little easier for the week, and has challenged me to cook a good healthy meal on a night we would have maybe just had cereal or boxed mac and cheese. I've also tried new recipes, and my kids are more willing to try new foods that someone else brings over. Big tip if you're going to try this, choose a family of similar size and lifestyle as yours. My dinner swap buddy and I are similar in our cooking styles, and we're both running kids to and fro for sports etc, so not having to cook on our most busy night is lovely. We commit to a main dish, and two sides, preferable fresh, not canned. Thanks! I too have such a problem with this, LIke you I love whole foods, i could spend hours browsing the aisles with all the fancy foods and delicious fine teas, but i have a strict budget to stick too, (we just bought our first house in may 2010) So I have been trying to make lists but i'm horrible at it....Maybe I should stay out of whole foods, although Trader JOes is where we normally shop, it can be dangerous as well! Im going to try out your ideas! Thank you much! I love simplified meal planning and your binder is a great way to categorize all those wonderful recipes I keep finding. My favorite thing about cooking like this is the leftovers for lunch. It's much nicer to go 'shopping' in my freezer for a yummy lunch to take to work. Especially since eating out is so darned draining on the budget. Menu planning absolutely saves you tons of money. I love your idea of dividing your recipes into categories, my recipes could use some organizing! Once you start menu planning, you feel awful about all the money and food you used to waste! I am in the process of making a "what's for dinner" binder myself and it's very close to what you are doing...only I am also using the weekly Publix sales add and matching coupons to plan my weekly dinners. Excellent advise. And this would also go hand in hand with shedding a few pounds. If you plan your meals ahead you are less likely to eat out or make a quick processed food item that is awful for you. We've just started the menu planning too and it not only saves money, it's also a huge relief not to have to dream up a meal each night. We have "Fend for yourself night" when we don't feel like cooking. Not even kidding, my mom cooks dinner 6 nights a week and during the last week of each month, I swear she sends out a menu for the ENTIRE month. Seriously. not joking. This way for those who don't live at home can tell her what day(s) we will be there and she can plan accordingly. She's made weekly menu's for over 20 years.. the monthly menu started a little over a year ago.. Sometimes all the leftover veggies and meats wind up in a big pot of soup. Other times I combine the leftovers in a skillet as a hash, pour cornbread batter over the top, and bake it in the oven as "skillet surprise." Then if we don't have any leftovers but I'm too tired to tackle a complete meal, I volunteer to make biscuits if my husband will fry up some bacon and scramble some eggs: breakfast for dinner! I wish I could see your system up close. I hate reinventing the wheel! I try to remember to use up my veggies before they turn, but if I feel like I really won't get to them, I do some minimal prep and trow them in the freezer. They may not be as good as fresh, but they can go into a soup, casserole, frittata, quiche, etc. Seriously, I really needed a good idea like this! I have 4 kids who are in activities and I'm always spending way too much at the grocery store and running out at the last min. because I fail to plan ahead! I'm trying this strategy next week. These tips are fairly good, though I've heard/read them a few times before. I think what would really make this post more valuable and user-friendly would be to have more pictures of Jennifer's book (and what looked like some sort of menu list? Where did she get that?) so readers could get a little more of the "how-to." Thanks. i have done this for many years and when i don't i spend so much more money and we don't even eat as well! post your favorite recipes! Hi Annie! I bought this pendant kit from Making Memories' Vintage Groove jewelry line. I'm not sure what it was called, but here's a link to it so you can see it and hopefully track it down! GREAT ideas!! I will be implementing and I can't wait to share with my daughter! You were right about the fact that food purchased on sale "tastes" better! I agree! I love this! I have a question though. When you are creating your binder. What did you do with recipes you love that are in a cookbook? Did you copy them and put them in or just have a list of where to find the recipe if you want to make it? Good questions from "The Groves"! I make a copy of the recipe. I might mention that I actually have 4 binders of recipes. One for holiday foods, one for treats and desserts and one for bread type stuff, potatoes and rice and other side dishes and then the one for my meal plans. I like to try new recipes and so I print them from the internet or rip them out of cookbooks that I got at a thrift store. 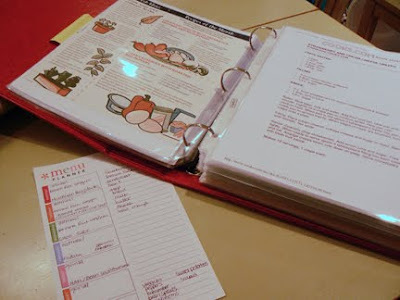 I have a bunch of favorite cookbooks that are still intact and if I want to cook an item on a regular basis from that cookbook I copy it and put in in the meal planning binder. Thank you soooooooooooo much! I have been planning for a long time, but your binder with the full recipes in it is the final piece of the puzzle I was searching for! Everything fits! Thanks Jennifer. That helps. I am inspired to get my cookbooks/meal planning organized! I cut out little rolling pins with my cricut and wrote a menu item on each one, laminated it with packing tape and attached a piece of magnet to the back of it. when we plan our menu we can choose rotisserrie chicken, mashed potatoes, salad...each on a separate rolling pin to mix and match. They stick nicely to the side of the fridge in nice simple frames with the days of the week above them. I made a book with covered flashing to keep the ingredients in that we dont have on the fridge. With only 2 of us I put shepards pie in individual bakers and freeze 4 and cook 2. This makes meals easier. I love your Menu Binder and Shopping List!!! Would you please share where you got your graphics or inserts for your binder as well as where you purchased your shopping list?!?! This is a great post, but I have one off topic question. What is the page pictured on the left side of your binder?